I am going to review what I wrote late last December about this film. "Icarus" seems like an odd choice for a political film, as it's nominally about sports. However, it ended up being about the politics of sports. The Atlantic explains how that happened. Watch the Official Trailer for "Icarus" from Netflix to see the highlights of the film. To make it even more explicit, watch Bryan Fogel Accidentally Documented the Russian Olympic Doping Scandal from Late Night with Seth Meyers. 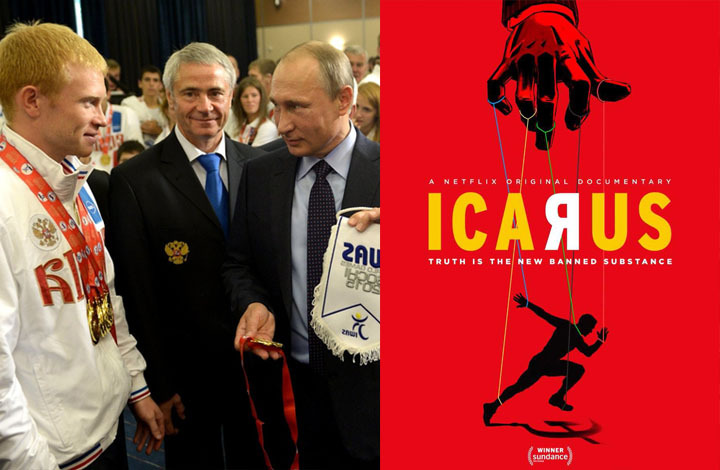 Bryan Fogel explains how he unintentionally documented the Russian Olympic doping scandal for his film Icarus and helped the mastermind escape to the U.S.
Notice whose name shows up in both clips, Vladimir Putin, who is in a bad bromance with Trump and meddled on his behalf during the 2016 election. Voting for "Icarus" not only recognized a great piece of documentary film-making, but sent a message of disapproval to Putin and Russia, not just about the doping, but about his interfering in the election on behalf of Trump. No other nominee could have done that, not "Strong Island" even with its "Black Lives Matter" message, not "Abacaus" with its own anti-racist theme, not "Last Men in Aleppo," and certainly not the apolitical "Faces, Places." I had a hunch that might happen, but followed the data, which suggested an entirely different outcome. Sometimes, I have to examine my assumptions in order to understand things. As I've written before about awards shows, electorates matter, and the Oscar electorate was mad at Trump and Putin. Why shouldn't athletes use any and all methods to improve their performance? Allowing doping would turn the events into a competition for the best doping techniques rather than the best athletes. All competitions need to have some rules. Why not let marathon runners compete by driving cars instead of running? The rules are defined by what kind of competition it's supposed to be. "Why not let marathon runners compete by driving cars instead of running?" Strawman. Oh, my, I was thinking of introducing you two and here you are. I think the two of you are getting off on the wrong foot. Nebris, you might find a more agreeable topic over at Infidel 753's blog, where he asks "Are men necessary? You've thought about that question for decades and would have something constructive and interesting to say about it. Perfectly analogous to the doping question. In both cases it would mean changing the competition into a contest over who could come up with the best technology (the best doping techniques / the fastest cars), something totally at odds with the original nature of the competition, in exactly the same way. Obviously the US has the best doping system because they mostly haven't been caught yet. Lets not forget that it was an American scandal that went on for years that initiated this investigation in the first place. That was Lance Armstrong, not a government operation, and it wasn't so good that he escaped detection and punishment indefinitely.